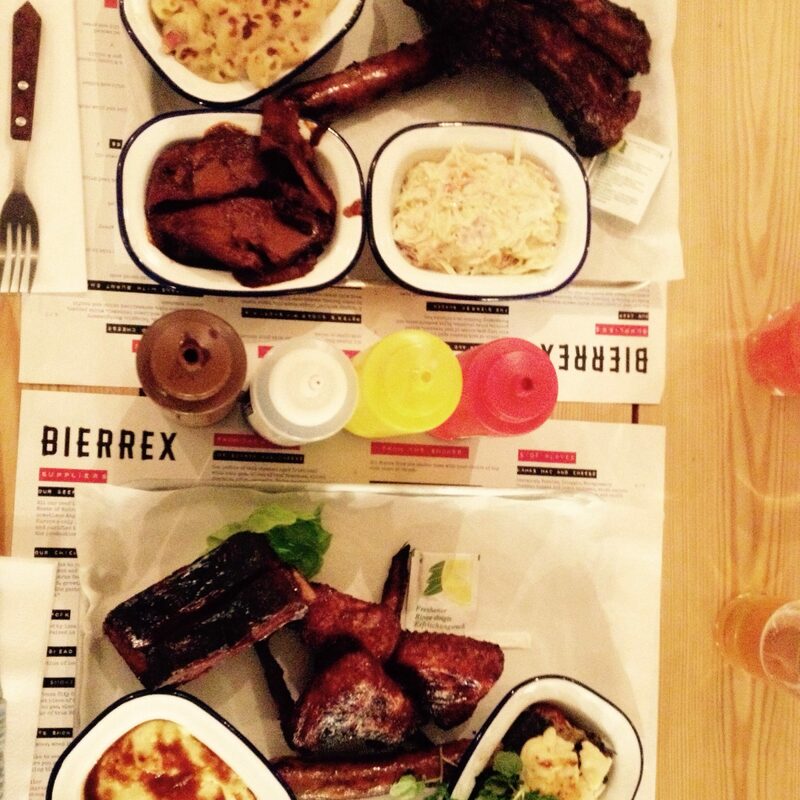 Bierrex hangs its hat on two things – beer (duh), and the best quality meat, aged in Europe’s only himalayan salt chamber and smoked in their wood fired ‘Fast Eddy’ smoker. 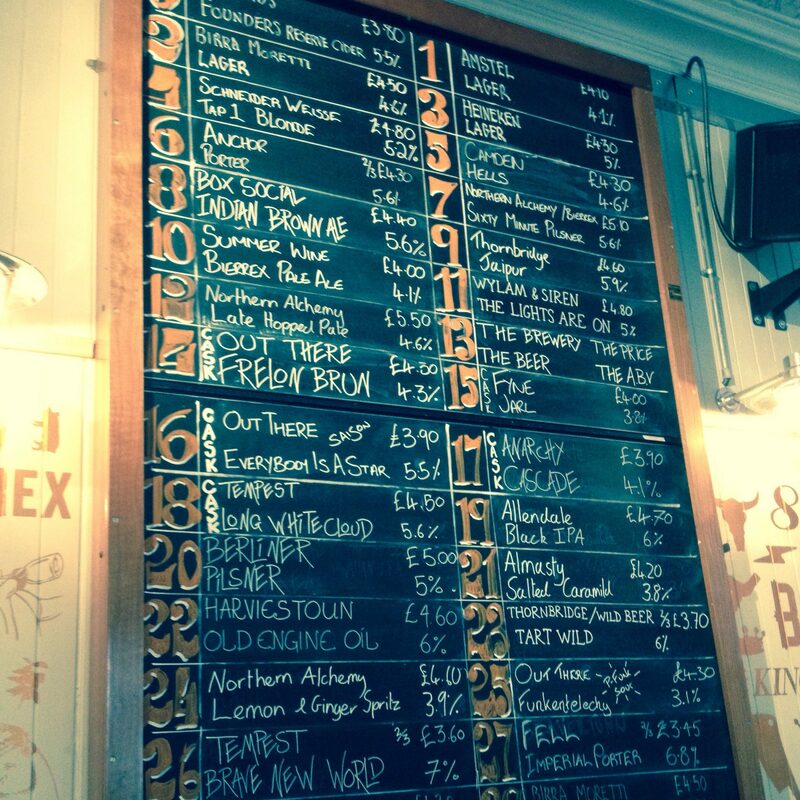 On the beer side they have 31 taps offering up an ever changing selection of craft beers, as well an impressive selection of bottled beers. 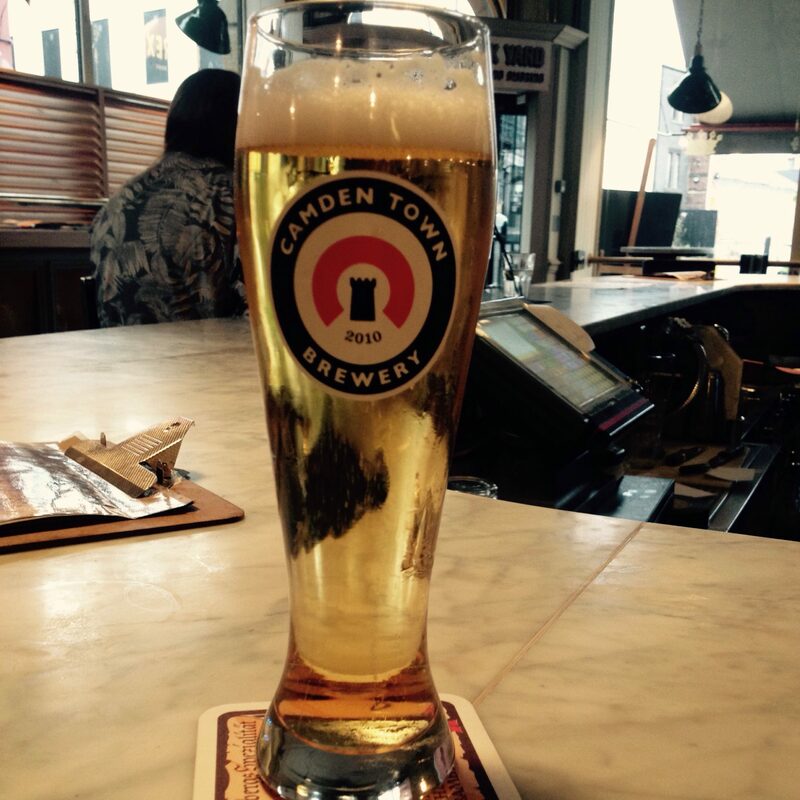 Arriving a little early at the former home of Popolo’s, I decided to sit at the bar and have a beer (well it’d be rude not to!) The very friendly and knowledgable bartender Ed asked me what I liked and selected four beers for me to try. It was a great way to gain a little beer knowledge and taste the difference between cask and keg before settling on the Berliner Pilsner, which was summery and refreshing on an a warm August evening in Newcastle. In the meantime my date had arrived and joined me at the bar for a San Pellegrino as she was driving. We enjoyed the lively atmosphere and hip hop beats mixed with retro tunes playing in the background, which added to the cool vibe. I think we were practically the only girls in the place on a quiet Monday eve but that wasn’t going to put us off! We were greeted by another knowledgable member of staff with a hipster moustache who took us through the menu and gave us a bit of background on the place. 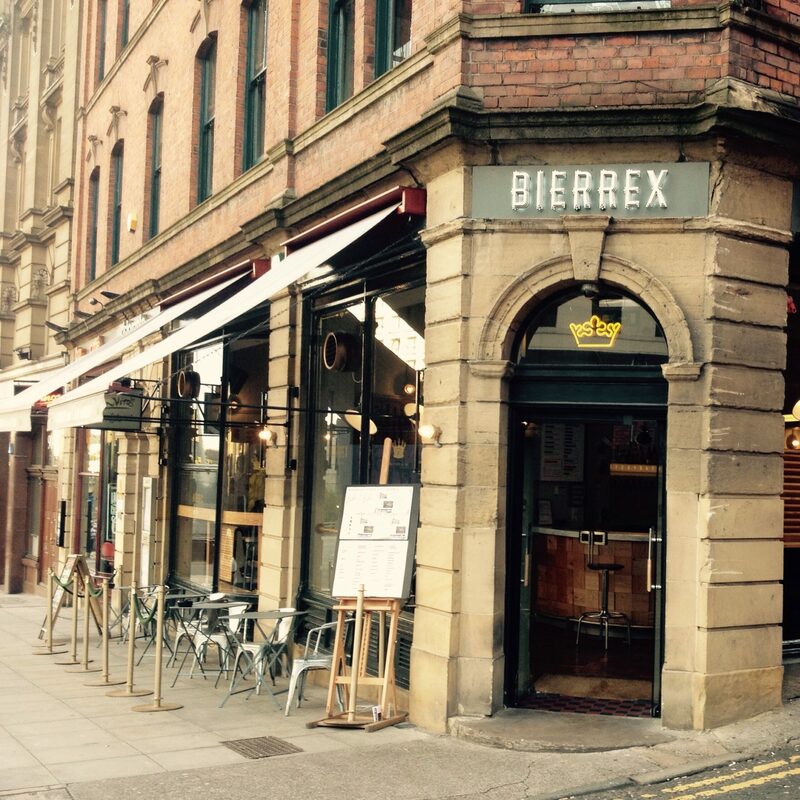 Bierrex is owned by an Italian family whose grandfather, a former boxer, came to Newcastle and steadily bought up surrounding real estate. They now own some of Newcastle’s coolest bars and restaurants including dAt bAr, Alvinos and Pasqualinos restaurant at the Theatre Royal. Assured by hipster ‘tashe that the Italian influence made for an authentic Italian American foodie experience, he explained that their sausage was the ‘real’ hotdog – the way it tasted when the Italians brought it over to America, before the yanks took all the flavour out. As there was so much delicious sounding food on offer GG and I both decided to go for BBQ combo plates which offer 3 meats and 2 sides for £12. The menu, which doubles as a placemat, also includes burgers, salads and lots of interesting sounding sides as well as descriptions of the sourcing and cooking process. No starters as such but I guess you can have a side as a starter; we decided to delve straight into the BBQ platters. My choices were Peter’s Sugar Pit Short Rib (A “mighty marbled” single short rib, sugar cured by Peter Hannan, smoked over hickory and fruit wood with green apple and coriander salsa), hot link sausages (2 x 100% ground pork sausages with fennel, chilli and cayenne, apple & oak smoked in a natural skin with hot and smokey ‘Dat sauce’) and wings ‘n things (Goosnargh chicken wings & thighs, 5 spice & honey rubbed & oak smoked with sesame seed, ginger, chilli & coriander). I have always wanted to see what grits taste like so for my sides I picked grits ‘n gravy (Soft polenta mash with drippings gravy) and smoked veg stack (Smoked aubergine, roast pepper and smoked mozzarella cheese with tomato confit and green tomato chilli sauce). GG went for the sausages too, Glenarm brisket (Glenarm dry-aged short horn beef, mustard and house spice rubbed, 14 hour hickory smoked with pickled jalapeños) and St Louis Ribs (House spice rubbed pork spare ribs 6 hour smoked over apple & oak, with green tomatoes and apple salsa). She went for mama’s mac and cheese (Scarmorze, Fontina, Taleggio, Montgommery Cheddar, nutmeg and lemon béchamel, white pepper, smoked bacon bits, caramelised onion and confit cherry tomatoes) and some mustard slaw on the side. 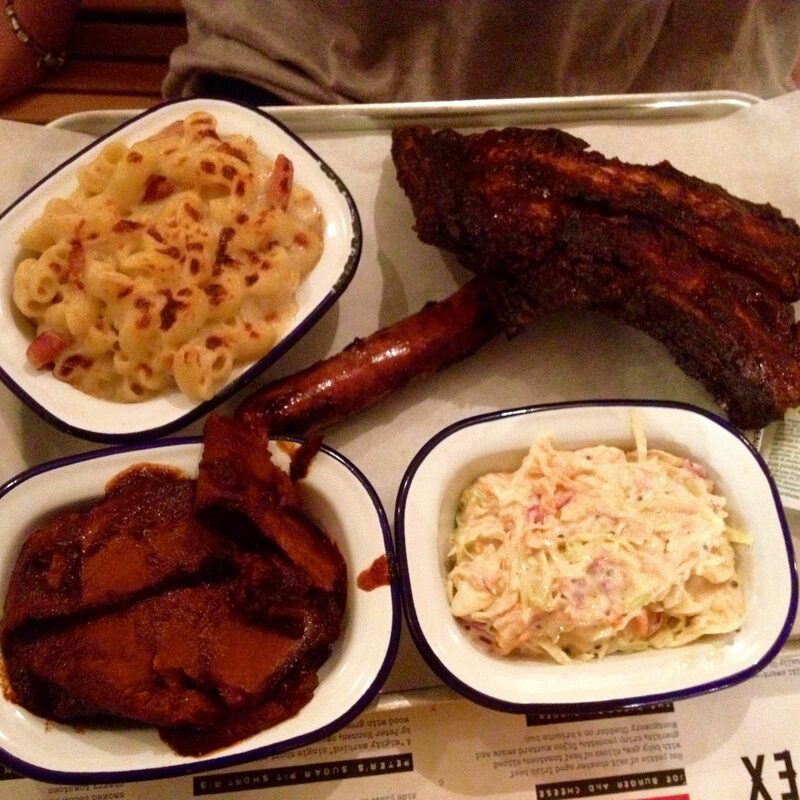 Our BBQ meats arrived in a tin tray, because, really – a plate couldn’t contain this much food! We were told what each of the four condiments were in the middle of the table, none of your bog standard BBQ sauce or mayo here! I grabbed a Goosnargh chicken wing, which was moist and succulent and subtly seasoned (probably so you could taste the quality of the corn fed meat) and added some homemade hot sauce to it which gave it a nice kick. Next I tried a bit of the sausage and wow, what a flavoursome wiener! It had a good bite to it, great seasoning – especially the fennel seeds – and then I was hit by the chilli and cayenne. Smoky and cooked to perfection, there was only one on my plate as opposed to the two on the menu but it was a big banger so I didn’t feel cheated. Last but not least was the piece de resistance. Peter’s Sugar Pit Short Ribs were a beautiful deep red colour from the smoking process and the sugar cure gave it a lovely sweetness, the marbled beef melted in my mouth. Without a doubt the best beef ribs I have ever tasted (and I’ve had ribs in the States). Top marks to Peter Hannan, their supplier over the pond in Ireland, and of course the guys in the kitchen feeding Fast Eddy. The grits were a slight disappointment, maybe because I didn’t realise it is basically just soft polenta! It tasted like a slightly more granular mash. The veg stack was a revelation, and perhaps the most smokey tasting thing on my plate/tray. The smoked aubergine and mozzarella were delicious and a great accompaniment. It was time for another beer so I remembered Ed’s tasting notes and went for the Bierrex pale ale (Ed’s favourite) which is brewed by Summer Wine brewery in North Yorkshire. A delicious light cask beer which went great with the BBQ meat. GG had some of her sliced brisket, which was tender but didn’t pack the jalepeño punch as promised. She loved the sausage too, but by far her favourite thing was mama’s mac n’ cheese. I mean – five cheeses AND bacon? What could be better than that! We compared ribs and after tasting mine GG was a little jealous as hers didn’t quite match up; they were a little on the chewy side and had less meat on the bone. Her slaw did what it said on the tin, a good home made coleslaw (they also do a ‘super slaw’ which GG said she’d like to try next time). When we’d eaten as much as we could manage GG was asked if she wanted her leftovers bagged up, convincing us that we’d been transported to America for the evening. Her boyfriend was very happy to help her finish off the brisket! 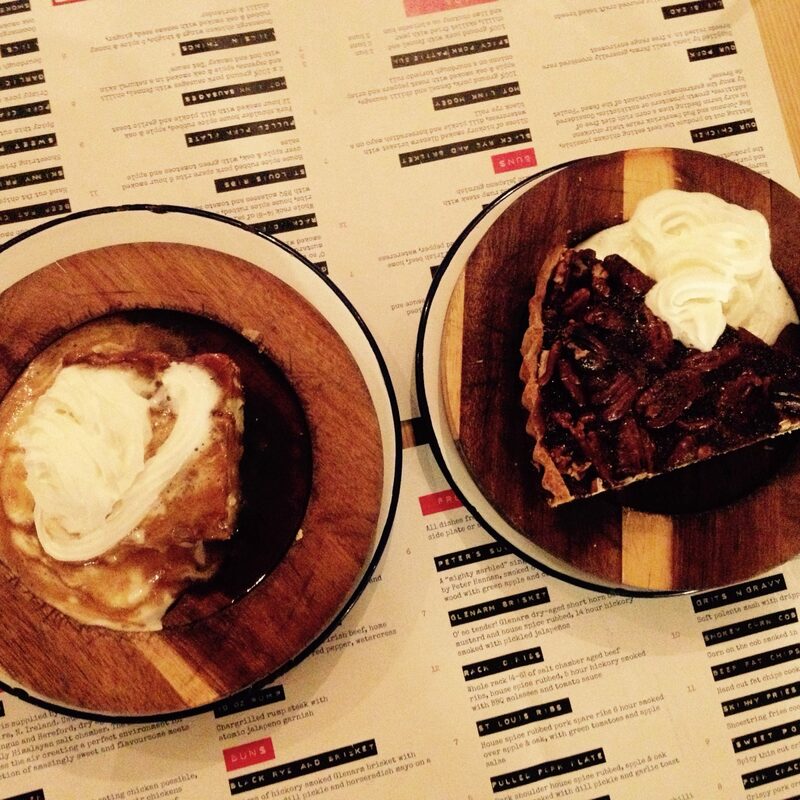 The pecan pie slice was a big hunk of home comfort, it was packed with whole nuts and topped with cream and maple syrup. The banana blondie had a slightly unusual texture which we deduced was probably down to whole pieces of smoked banana inside. Luckily the smoking process didn’t overpower the cake and the butterscotch bourbon sauce was completely delicious and GG in particular was very taken by it. We said our goodbyes to the friendly staff who were by now cashing up, but quite happy to let us take our time (sorry guys….!) 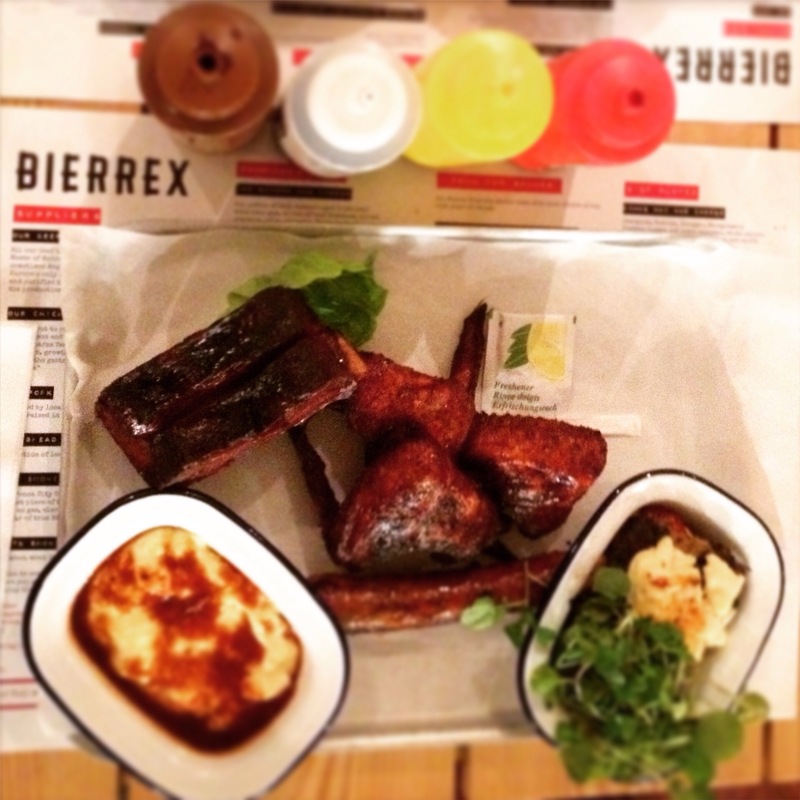 Bierrex is one to try if you’re hankering after a slice of Americana in the Toon; good beer, flavoursome meat and value for money. They do a lunchtime special which is only £3.50(! ), which is a great for a quick midweek lunch. Something tells me… we will be back! GG and I were provided with a complimentary meal for the purposes of this review. However the opinions expressed in this article are honest and true to experience.